You will be using this screen to edit and update the price lists which you have created in Create Price List screen. Also, this is the place where you can review your product pricing details. As soon as you open this screen, all the product price lists will appear here. Please use the following selections to display the product record you are looking for. 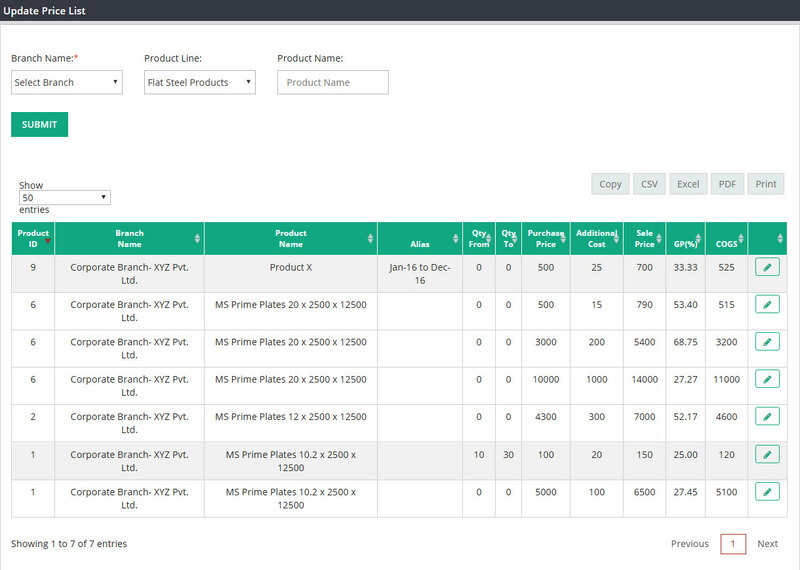 Branch Name : If you are a multi branch company, please enter the branch name to see the product pricing details for a specific branch. For single branch company, name of your company will appear here and you can ignore this field. Product Line : Please enter Product line name to see all the products associated with this price line. You can type *. * to select the product line from list of all available product lines. Product Name : Please enter the product name and click on submit to display that product price list. Once you click on SUBMIT data will display as per your selection with following column headings. Product ID : This column will display system created product ID. Branch Name : Branch or company name will appear here. Product Name : Product name . Alias : While creating the price list for this product if you given any name to that in Create Price List-Alias filed , that will appear here. Qty From –Qty To : If quantity break pricing was assigned to this product, then that information will display here. Purchase Cost : Product purchase cost which you added while creating the price list. 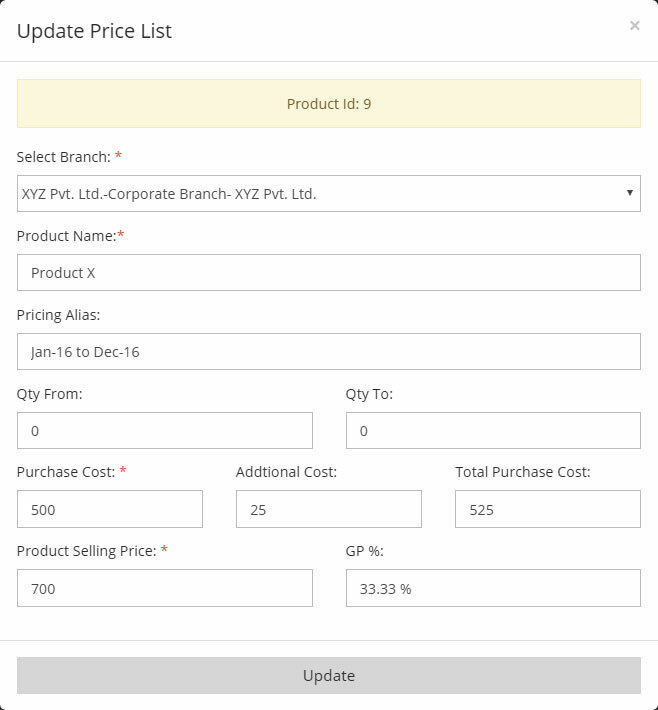 Additional Cost : If any additional purchase cost was mentioned in create price list screen against this product. Sale Price : Product selling price which was recorded while creating the price list. GP% : Gross profit % between Total Purchase Cost(here COGS amount) and sale price. After reviewing all these details if you want to edit or update any price list, then please click on the EDIT button next to each line and system will take you to the screen where you can update the information. After making the changes in Update Price List screen, please click on Update to save your changes.